- Cook polenta separately. The corn meal does not add much to the volume, so start with a quantity of water equal to how much polenta you'd like to cook. Add some salt, and bring to a boil. When it boils, add the corn mean, and keep stirring occasionally for as much as 25 minutes (you may want to check the instructions on the corn meal package - the instant corn meal I am using takes 5 minutes to fully cook). - Fry the mushrooms in a pan with a bit of oil. If you like the garlic taste, remove the mushrooms when ready, add the mudjei, and mix together. If you don't like the garlic flavor too much, add the mudjei to the mushrooms in the pan, and cook for a few extra minutes. - Select a deep bowl that's resistant to heat. Place a cup or some other round dish inside, face down. Add the polenta all around, and press it down. Make sure the top surface is flat and uniform. Let it cool (10-15 minutes) - you could prepare the mushrooms during this time. 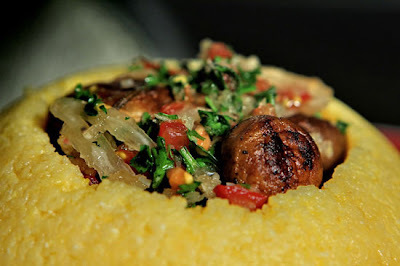 Flip the polenta around, and place the mushroom+mujdei mix in the empty space previously occupied by the cup.